Cold water and rough sand swirled around my toes as I stepped into the lake. It was a welcome caress on the cabin fever of my feet. With one last heave, I slid my goldfinch-yellow kayak into the water. Frothy gray clouds left over from scattered showers polished each ripple into a mirror as I pushed off from shore. Easy strokes soon propelled me around the point, heading for the bay where the loons always nest. Are they back? I’ve been expecting to hear their wails slip in through the tiny crack I’ve opened in my bedroom window. A chorus of frogs has been shouting my lullaby so far, and the calls of other returning migrants fill the day. The tiny, urgent, winter wren lets forth a tinkling stream of notes in the ravine. Tireless song sparrows shout “Maids, maids, put on your tea kettle-ettle-ettle,” over and over from the highest tips of alder brush. One white-throated sparrow sang “Oh sweet Canada, Canada, Canada,” as it hurried north. The pre-historic, rattling cries of sandhill cranes. The whinny of robins. But no loons. Scanning the waves for any speck of a loon, movement in the tree line caught my eye. I strained for a better look. Great flapping wings, with both white and black feathers, came in and out of view. “Could it be?” I hoped. And then nodded with satisfaction as the great shape swooped up to land on the utility pole where the ospreys live. Last year that nest ended in tragedy, with only one of the family of four surviving. This year, we already have new owners and a half-built nest. Turning into a boggy bay, I startled some wood ducks, who burst out of the dried reeds in a flurry of squeaky alarm calls. Then another noise—or was it a movement—caught my attention. Either way, I turned back toward the osprey nest in time to see a flash of white on an eagle’s head as it wheeled in the sky, chasing…or chased by – I couldn’t tell – the smaller osprey. Eagles are majestic. They are also bullies. The technical term is “kleptoparasites,” which means that they will bother an osprey until it drops a fish, then swoop down and claim the snack for their own. Eagles are also the only common predator of adult loons. Which is what triggered the sound that caught my attention. Two loons were alarming at the eagle, with harsh cries to send shivers up your spine. “They are back!” I thought, as I alternated between scanning the water in their direction and following the aerial battle. A smaller bird, probably a crow, joined in the chase. Soon it was clear that the eagle was on the run, and the osprey escorted it to some invisible boundary before swinging around and heading back to its nest. I paddled toward the now-quiet loons. Straining my eyes, two black dots soon distinguished themselves from the distant shoreline. It had to be them. At this point in the season, any two loons who can be in such close proximity without yodeling conflicts must be a pair. Are these the same loons who reared one chick safely into October last year? It is impossible to tell without bands, but the research suggests that it is likely. Loons have an incredible sense of place. They will choose a territory as much like the one they were born on as possible. 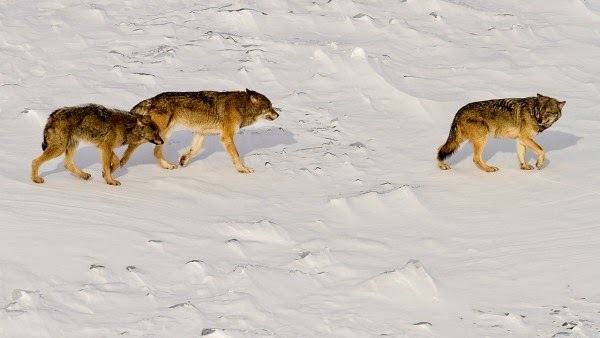 Once they have a territory, they prefer to keep it. The place-based knowledge they acquire each year– the best nesting spots, best fishing spots, common hazards – is invaluable. While it is possible for loons to mate for life, it is their attraction to a territory—not each other—that keeps them together. By now I had slid close enough to see the gleaming white and inky black checkers on their backs, and the sleek swoops of their foreheads. Over the winter, loons lose all of their flight feathers at once as they molt back into breeding plumage. It is known as the “pre-nuptial” molt, and they arrive here looking their best and ready to woo a mate. I drifted in the evening light as the loons courted nearby. The birds swam toward each other for a distance. When they got within several feet, one loon spun around and they both swam the same direction. After a moment, one dove, surfaced farther away, and the routine would start again. Their coy behavior and snazzy black-and-white garb reminded me of a blurb about Senior Prom I read in the newspaper’s events calendar. Spring is here. With it comes young and hopeful life decked out in many styles of tuxedoes and rainbows of colorful gowns. Everyone must sing, perform, defend, watch, or choose according to their own, individual, natures. Who have you been admiring this spring? It was a beautiful day for a hike in Fairyland. This State Natural Area is named for the “relatively undisturbed old growth hemlock hardwood forest” that forms its core. Stands of mature, second-growth hardwoods surround the hemlocks, and ephemeral ponds poke holes up to the sky through the hemlocks’ dense green canopy. This forest was once owned by Mary Griggs Burke, founder of the Cable Natural History Museum. Legend has it that Mrs. Burke found solace in the groves as a child, and then, as an adult, set up fairy tea parties in the woods for her young friends. The sense of magic remains. Our chilly morning meant easy walking on frozen ground, and bright sunshine added cheer to the crisp air, as we pushed through a branchy balsam fir thicket into the open, park-like hemlock grove. We paused to breathe in the primeval atmosphere. Patchworks of emerald, olive, and chartreuse moss draped over soft, sunken logs. Hummocks and swales in the forest floor told tales of large trees, long fallen. Their huge root masses, ripped from the ground by a strong wind, had once risen above the soil. Rain, snow, and rot had knocked down the masses, crumbled their massive trunks, and now they lay like sleeping giants under the duff. The ground-level caverns and raised root-knees of hemlock and yellow birch trunks gave us shadowy visions of the nurse logs and stumps their seeds had sprouted on long ago. The young, growing trees had embraced their damp, fertile nurseries, only to have the old wood vanish into the soil and leave empty space behind. We all admired the cavities in the bases of trees, and examined them for signs of habitation. A few red squirrel middens, littered with piles of shucked cone brackets, spilled onto the ground. But Vivianne Hanke, who teaches fairy house making workshops for the Museum, had other ideas. “There’s a Fairy House!” she exclaimed quietly, pulling out her camera to take a photo of a castle-like mossy stump. “Here’s another one,” she murmured into the space left beneath a yellow birch’s roots. Soon we were all joining in her search. Almost any tree, we discovered, could be quickly inhabited by our imaginations. With her eyes on the ground, Vivianne soon found another fairy home. “I almost stepped on it,” she chuckled, handing me the papery gray pouch. It didn’t look like much. A few leaf veins were still visible, but most of the case was reinforced with fine, tan-colored silk. “Promethea moth?” I said to the little cocoon in my hand; half-hoping that it would identify itself. While we were looking into stumps for fairies, here was the winter home of a real live fairy right under our feet. Callosamia promethea are large, beautiful silkmoths, with black, tan, pink, and redidish-brown wings. Their caterpillars attach a leaf to its twig with an extra-strong lash of silk, pull the leaf around, them, and then spin a second tough, hairy chamber inside. Within those two layers of nearly impenetrable silk, the caterpillar forms its pupa and waits out the winter. But when I took the cocoon home to examine it, I soon noticed a long groove in the back of the pouch. This cocoon had been attached to a twig along its entire length, not just from a thin, reinforced stem. With a few more queries on Google Images (the best way I’ve found to identify insects! ), I soon came to the tentative identification of Hyalophora cecropia, the Cecropia silk moth, instead. Cecropias are North America's largest native moth, and share a similar rich, black and reddish-brown coloration with Promethea moths. Fairies indeed. In an ideal world, a beautiful moth would emerge from this cocoon in mid-summer, cling to someone’s screen door under the porch light, find a mate, lay eggs, and then expire peacefully in the night. Unfortunately, this cocoon only contained the dried, crumbled remains of a parasitized pupa. I almost wish I hadn’t opened it. Like Schrödinger's cat, if I didn’t know, I could still imagine that a viable moth pupa rested inside. Glancing down at the empty shell resting near my keyboard, my mind wandered away from the death I’d found, and returned to a series of online photographs of a plump, fluorescent green caterpillar with multi-colored spikes, spinning a similar home. A living creature had made this! Almost anything, we discovered, can be quickly inhabited by our imaginations. Sunlight streamed through the tree trunks as we meandered into the warming woods. The Ruffed Grouse’s thumping faded into the distance as we left his territory. In its place a loud, staccato drumming echoed through the hills, followed by the wildly laughing cry of a Pileated Woodpecker. My ornithology professor nicknamed pileateds the “monkeys of the Northwoods” due to their raucous, whinnying calls. Like grouse, Pileated Woodpeckers are not daunted by our northern winters, and maintain their mates and territories throughout the year. Activity has ramped up recently, though, with the onset of spring and breeding season. Unlike the melodious warblers who are singing their way north right now, woodpeckers use drumming to attract a mate and defend a territory. “With such energy did he hammer that his whole body shook and his wings quivered. He fairly hurled himself wildly at it,” described the naturalist Ernest Waters Vickers in 1915. They add to the pulse of the forest. Woodpeckers beat on trees for three main reasons: to forage for food, to excavate a nest cavity, and to drum for communication. The first two are relatively quiet affairs, done slowly and deliberately. The third is as loud as possible. Woodpeckers prefer the resonant acoustics of a hollow trunk or branch on which to drum—or a stove pipe or rain gutter—to make sure that their message gets across loud and clear. Both male and females drum. After the thrill of their mating rituals come the more domestic duties. Pileated Woodpeckers use their large, straight, chisel-like bill to excavate a new nest hole each year. The male seems to do most of the excavation of oblong hole, removing wood chips from the area as they go. Dense, mature forests tend to contain the large, dead trees that they prefer. In young forests, when old, dead nest trees are the tallest ones around, lightning can present a hazard to nesting birds. Although there is a significant time investment – each cavity takes 3-6 weeks to complete – woodpeckers will not reuse the hole in subsequent years. This probably serves to protect the babies from parasites, or from mammalian predators who might remember the location from year to year. In the years after the woodpeckers raise their brood of 3-5 young, a wide variety of birds and mammals will use the abandoned cavities. Other woodpeckers, wood ducks, bluebirds, flycatchers, owls, bats, squirrels, and pine martens all benefit from pre-drilled cavities. 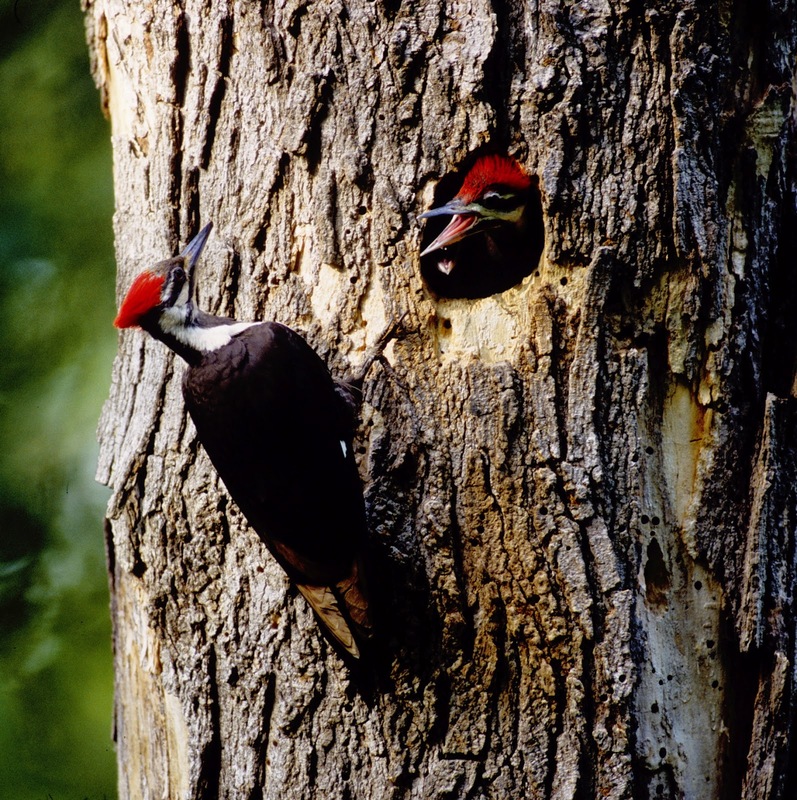 This makes Pileated Woodpeckers a keystone species for their crucial role in creating habitat. The pileated pair leap-frogged their way deeper into the forest, and we continued hiking. Several times we noticed piles of fresh wood chips near the trail, and looked up to find a tree trunk perforated by large, rectangular holes from the woodpeckers’ foraging activities. Nest trees have no such tell-tale signs, since the birds carry away all chips, nest debris, and feces that might give away the location of eggs and babies to a nest predator. These days, it seems our Pileated Woodpeckers are having good luck with reproduction. Hardly a day goes by when I don’t hear the “monkey of the Northwoods,” or catch a glimpse of this striking black-and-white bird in its undulating flight. It wasn’t always that way. Pileateds were considered rare in 1900s, due to habitat loss and hunting. When the forests rebounded, so did the birds. I like the sound of that.